One of my favorite recipes from my mom, is a recipe for crepes. She usually filled them with creamed, and sweetened, farmer’s cheese. I like my crepes filled with fresh fruits, or fruit preserves ( I use Smucker’s Sugar Free Fruit Preserves), served with fruit syrup (also by Smucker’s), and whipped cream. This dish may be served as a light main course, or as a dessert. Makes about 8 crepes. Beat the eggs until light. Add milk, water, sugar, salt, flour, and vanilla extract. Use a small frying pan, about 6 inches in diameter. Oil lightly the frying pan, and heat well. Pour a few tablespoons of the batter into the pan, just enough to give it a thin coating. Tilt the pan back and forth to spread the batter evenly. Cook the cakes over a moderate heat, and when lightly browned on the bottom and firm to touch on top (do not turn over, to ensure tenderness). Remove from pan and place on a warm plate, to keep them warm. Oil the pan lightly after each use, and repeat the above frying technique until all the batter is used. Use one crepe at a time, placing it on a plate with the browned side down. 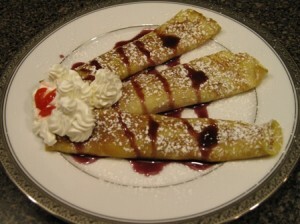 Spread each crepe with your favorite filling (creamed cheese, fresh fruits, fruit preserves). Lift one end of crepe and roll up, jelly roll style. Repeat with all crepes until all used up. Serve warm crepes with syrup and whipped cream, or lightly browned on both sides in a warm pan with melted butter, if you prefer a crispier texture. Very easy to make….you should give it a try. I love fruit, this looks like an awesome breakfast. Oh yes, these can be served for breakfast or as a dessert. Delicious!